I have spent a solid chunk of my life in rapturous study of ancient Egypt. Nothing fuels me or fills me with greater satisfaction. As my studies have broadened, I have found my niches of interest. I’m fascinated by the language, and that’s my predominant interest, but I have also developed an obsession for the characters that used to spend the winter yachting up and down the Nile. The European and American visitors to Egypt in the late 1800s and early 1900s are a complete delight. If I could only read travel journals from this time for the rest of my life, well I’d be damned happy. One of these travelers was a rich man named Theodore Davis. He is infamous in Egyptology because of his incredible ability to discover a new tomb all the time, but also because modern scholars scoff at his methods and conclusions. I have never thought much of him, but he has been a constant presence in my research. When I came across this book, I had to have it, and I just finished devouring it. And reader, it has left me shaken to my core. The best part of learning is that it’s never over, you know, and when you start looking into one thing, you discover an entire world that should have been in your face the entire time. Theodore Davis is the reason so many artifacts are in grand museums around the world. In the Metropolitan, you can see so much of his generosity. And in Cairo at the Egyptian Museum, there are entire rooms filled with things his excavations uncovered. And to most people he is just a name that they don’t think of — if they think of him at all. But then I started reading The Millionaire and the Mummies and I began screeching in the most delirious fashion. You see, reader, when Theodore was making his first fortune, he spent a DECADE in IOWA CITY. WHAT???? I was flabbergasted. Not but a few hours from me, one of the most important figures in the history of Egyptian archaeology spent a considerable chunk of his life. I can’t get over it. Isn’t it insane that I never knew? I am still reeling at the revelation. I need to plan a weekend trip to stalk out his life there, see if the libraries have any of his papers, if his mansion still stands, if there is any evidence of this man who unknowingly to me played such a vital part of my own life. Am I the reincarnated Theodore Davis? Probably not. This book filled me with complete joy. It was a great read that showcased early excavations in Egypt and the glorious gilded era in New York City. That is one era that I feel I probably should have lived through. I don’t have any grand delusions anymore that the past was better than the present, but that sounds like a glorious time to be alive. Anyway, this book now holds a place of pride on the shelves of my Egyptological library. What a weird world. What a wonderful world! I know I am very behind on this one. Months and months behind. I could make all the same jokes they made on SNL last weekend. One of the lead actors was hosting and he was amazing. I saw the movie shortly after it was released and i haven’t been able to stop thinking about it. Going to see a Marvel film is not something I normally do. I have no interest in superhero pictures. I don’t want to see a comic book come to life. I don’t want to see imaginary people zipping through the air. It has nothing to do with my interests. But there was something about Black Panther that spoke to me. It was a combination of many things, but I feel the main thing drawing me into it was the fantastic soundtrack that I can’t get enough of and the fashion. The fashion is where it is at. I have grown insanely fond of African fashions, especially after my time in Egypt. I would love to swish around in a galabeya, and one of these days, I have every intention of doing so. I love the colors and vibrancy and the incredible embroidery of traditional African clothing. To see the characters wearing traditional clothing that was updated to fit into this alternative universe was worth the price of admission alone. 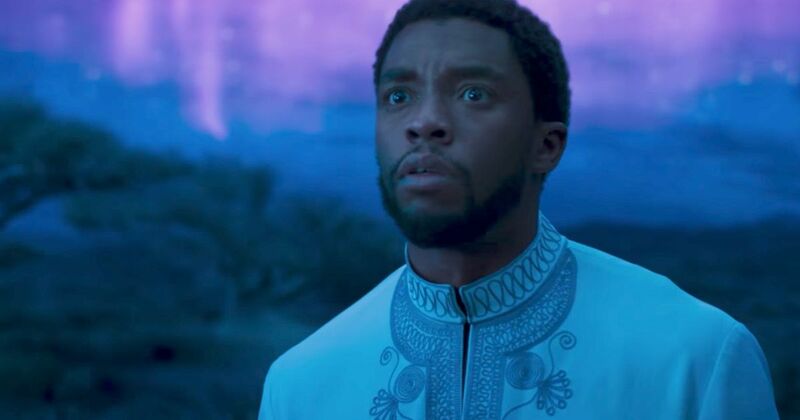 There is a scene where T’Challa, the ruler of Wakanda, goes to the other side to meet and talk with his father. He is wearing the most sumptuous white shirt with decadent embroidery. I squealed as I watched it. I wanted to wear it at all times. In addition to the incredible acting, the overwhelming visuals, and the stunning fashion, the entirety of the film was fabulous. It was not just a superhero movie, because it would certainly not have interested me if so, it was truly a reproach of colonialism and the lingering consequences of imperialism on the peoples of Africa. It was a celebration of African traditions and the truth that the people of this continent are a proud and noble and worthy people. I won’t give any of it away, because I think it was a phenomenal picture, and I think you should go see it if you haven’t managed to do so already. I would happily watch it another dozen times. It was fabulous. I may even buy this one when it comes out. I already blast the soundtrack every time I get into my car. There is this addicting drum beat that I constantly have in my head. I haven’t stopped thinking about this movie since the second I left the cinema. Truly a masterpiece. The idea of owning a Parisian apartment is the most intoxicating one in the world. Ever since pastry school, I have longed to have my own property somewhere in that city. As I age and I return again and again to that wonderful place, I have developed a particular passion for a suburb known as Clichy. It’s very close to Paris and the Métro and RER makes it readily accessible. The architecture is gorgeous, the bakeries are good, and there is just such an overwhelmingly good feeling in that area that I no longer crave to live in Paris proper. Besides Clichy is hella cheaper. One of these days before I die, I will own an apartment there. And I will have my retirement villa in Luxor. And everything will be grand and good. But this installment isn’t about my dream properties, it’s about a glorious book written by one of my favorite chefs, David Lebovitz. His blog has been a part of my life for as long as I can remember, and I have long envied him. He seemingly has it all. He spends his days baking and cooking and eating and running to the bakery. And he spends the rest of his time seemingly constantly engaged in the everyday tasks people in Paris get up to. I’d quite like to befriend chocolatiers and take tours to Switzerland and eat my body weight in cheese as he does. His book, l’appart, is about the struggles he went through buying and renovating an apartment all his own. After reading about all that he had to do, the disasters that he survived, the stresses he endured, and the incredible amounts of money he spent, I am no longer entirely sure that I want to go through with my Clichy apartment in the future. I know that if the opportunity ever presented itself, though, I would leap at the chance. David’s writing is very good, pleasant to read, and quite funny. The book is easy to devour in a couple sittings. Interspersed throughout the book are recipes that he developed while working on the apartment of his dreams. There is one for chocolate chip cookies made with buckwheat flour that changes everything. Like, I could not get over how good they were when I made a batch. If you love Paris at all, you owe it to yourself to pick up a copy. Is there anything in the world more fun than being over the top and extra and bougie? Of course there isn’t. Nothing is so satisfying as pretending to be a little more decadent and luxurious than usual. So when I first read about a moisturizer that was made with something called snail mucus extract, I immediately threw it into my Amazon cart. I didn’t think it could be real snail mucus, because that sounds atrocious, but it turns out it was! They take actual snails and spray them with saltwater. The snails hate this, so they excrete this slimy stuff that the chemists gather and use to make what is supposed to be a miracle cream. I couldn’t wait for mine to get here so that I could slather myself in snail mucus. The second it arrived I massaged it into my face and later I couldn’t stop touching my skin. It was so soft and it was so smooth and it felt beautifully taut. I couldn’t believe how grand it was and how fabulous I felt. I’ve been using it as a night cream now and I wake up glowing. I can’t get over it and I can’t recommend it enough. Allegedly it repairs skin damage, evens skin tone, hydrates deeply, and makes you look like a model if you use it consistently and long enough. I never intend to use another product before I lay myself down to sleep. I love those nasty snails. Go buy yourself some. It’s ridiculous. I love everything about it. I was reading an article in the New York Times the other day about little things that make your life better. One of the suggestions was a device that mopped the floor for you like one of those wonderful Roombas. The author said she had it clean her bathroom floor every day and the convenience of not having to do it herself had changed her life. I gasped at once because I needed this tool for myself. One of the chores that I do every single day is sweeping the kitchen floor. It takes all of two minutes, but reader, it makes me crazy. I hate doing it. I hate having to do anything, so when I found out this device existed, I had to try it out. Two days later it was at my front door and I literally told somebody that I had to run home and charge my robot before meeting later that afternoon. I felt ridiculously futuristic. The Bravaa is made by the same company that sells the Roomba, but it is a much more basic robot. It doesn’t have a station that it returns to charge to, it doesn’t have a super smart array of sensors, it has to have a new pad put on each time it’s used. But it was only two hundred dollars. That is still a bit much, I agree, for a machine to replace a simple chore, but I’m a ho for drama and luxury so it suited me right down to the ground. And I have to admit, the mopping it does isn’t exceptional. It works all right, but it the messes are dried on at all, it probably won’t get it squeaky clean the way you would by mopping yourself. So I’m not thrilled by this part of it. But I am absolutely delighted by the dry sweeping feature. Instead of mopping, it just brushes up all the dirt in your room. I am going to keep it just for this reason. The first time I had it run, it picked up so much cat hair that I was ashamed. I thought that my floor had been relatively clean. I was absolutely shaken to my core and filled with disgust. How could I have been so wrong? How could I have lived with such filth!?! It was revolutionary. 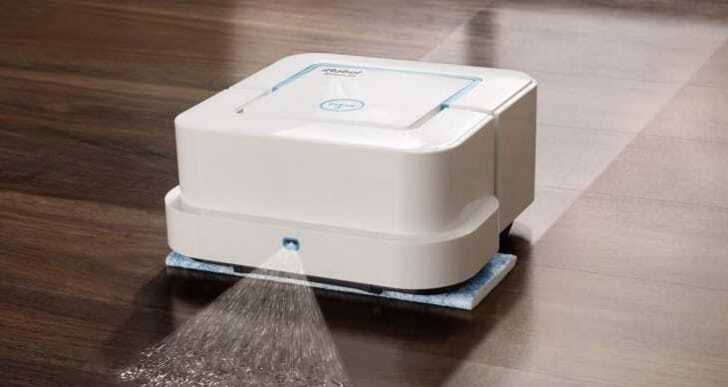 And, reader, there is nothing so rewarding as watching a robot clean your house for you. It fills me with complete contentment. I love my little robot. Now I need the vacuum one for the rest of the house and then I need one of those robotic litter boxes that scoops waste for you. Then I will truly be a citizen of the future. I simply cannot wait.